Junction and equalization box JB4PLUS. 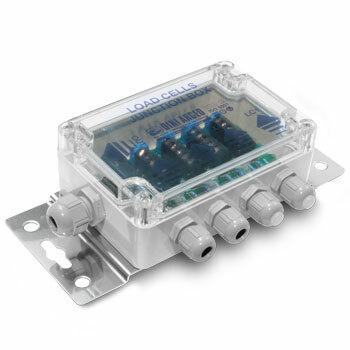 Junction box with 4 inputs and protection IP67 suitable for outdoor environments. It can be used as equalization or simple junction box of 2, 3 or 4 load cells. Screw terminal boards to facilitate the connection and signal adjustment trimmer, for an accurate and reliable equalization. The protection circuit protects from lightning and overvoltage. Case in ABS. Protection degree: IP67. Maximum input load cell signal: 1000mV. JB4PLUS Equalisation box for connection with up to 4 load cells. ABS box, IP67 protection degree, with 4 + 1 fairleads and surge arresters. GELBOX (S1) Anti condensation, insulating, and sealing gel. Useful for the protection of the electronic circuits of the weighing system, even in conditions of prolonged immersions in time. Pack of 300ml. JC4Q Equalisation board for up to 4 cells. With UL marked PCB, Terminal block, plastic box and labels (if expected). JB4 Junction box with up to 4 load cells. ABS box, IP67 protection degree, with 4 + 1 fairleads. JC10Q Equalisation board for up to 10 cells, fitted with surge arresters. JB10Q Equalisation box for connection with up to 10 analogue load cells. Reinforced polyester box, with 10 + 1 fairleads. With UL marked PCB, Terminal block, plastic box and labels (if expected). DGT4 Transmitter for DIN bar with 4 channels, 2 IN and 2 OUT. 5-key keypad, LED display, and standard weighing programme.